Many people ask "What is the most important factor in achieving the lowest number possible?" Lowering U-value is the measure of the total rate of heat transfer through an assembly expressed in BTUs per hour per square foot per degree Fahrenheit. Lower U-value is better. The total window U-value is calculated by area weighing the contribution of the frame, edge of glass and center of glass. 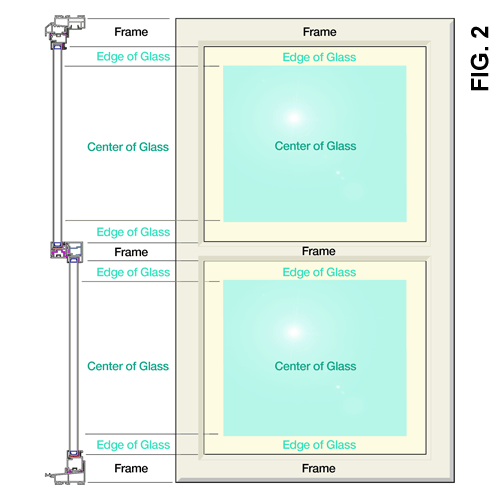 The edge of glass is measured starting from the sightline and going towards the center of glass 2.5." As one can see, in the attached drawings (figure 1 titled Picture, figure 2 titled Casement, figure 3 titled Double Hung) and described in TABLE I, the area of the frame, edge and center can change dramatically depending upon the frame height. However, in all cases the center of glass makes the most significant contribution. Heat is transferred by conduction, convection and radiation. Conduction is heat transferring to the handle of a stovetop metal cooking pan. Convection, like the cold air falling and hot air rising causing a convection current in a room. Radiation is the heat felt from the sun. The best way to lower U-value is to reduce conduction, convection and radiation wherever possible. Starting with the center of glass, low e coatings are used to reduce radiation. 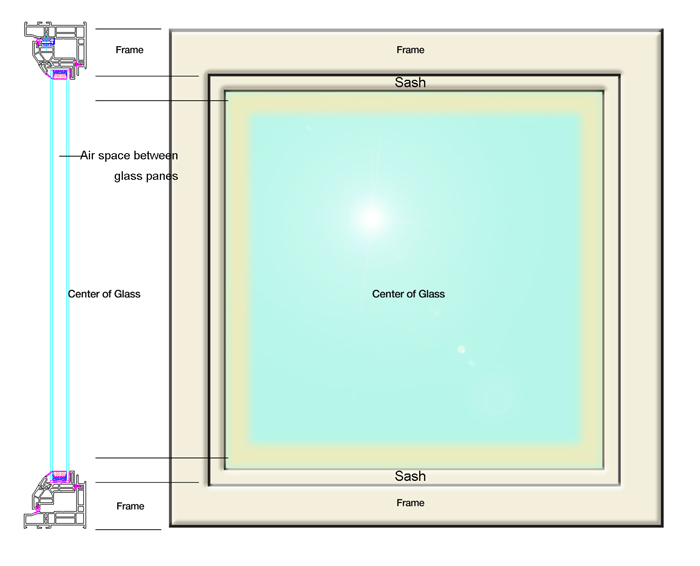 Argon gas is injected into the airspace between the glass panes to reduce conduction. Krypton gas, although expensive, is sometimes used instead of argon for even lower conduction. For best results balancing conduction and convection, gas filled gaps should be optimized. For argon, the best results are achieved with space a 0.50." For Krypton, best results are achieved at 0.30." The suspended films and triple glazing result in substantial reductions in U-value. Internal muntins have no effect on U-values as long as there is ample clearance between the muntin and the glass. This of course presents problems for optimized Krypton air spaces. 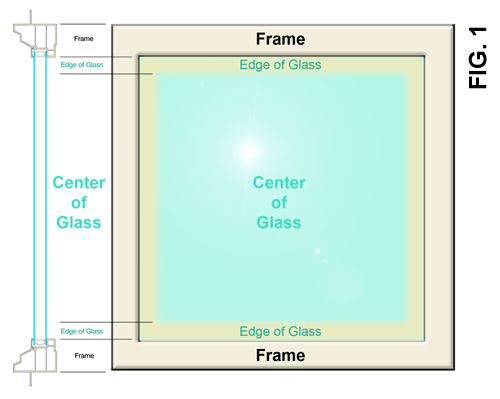 The edge of glass U-value is affected by the aforementioned center of glass selection, the frame selection and the spacer selection. To reduce conduction from the glass to the spacer, either a dual seal or an insulated spacer is recommended. Insulated spacers are the intuitive choice for U-value reduction. However, improvements in some metal spacers have made the differences almost negligible. This is primarily because although the metal spacer is very conductive, it is also very thin and transfers very little heat in a relative sense. The frame U-value is primarily affected by the conductivity of the frame material convection inside chambers, reinforcing conductivity and foam filling/die cut foams. Typical K (conduction rate) values for various materials are listed in TABLE II. Because total window U-value is area weighted, to achieve the lowest possible U-value in the most economical fashion, one should focus first on the glass and then on the frame and spacer depending upon design. The following table ranks U-value improvements from the most to least improvement. Assuming one starts with a typical aluminum reinforced, vinyl, double hung window with an optimized airspace, low-e and argon, the following improvements can be achieved as noted in TABLE III. A typical example of how one may reduce total window U-value is listed in TABLE IV. *Note: Whereas foam filling may have a perceived marketing value, in practical application, co-extruding foam, or injecting foam into lineals has little effect on total window U-value and presents issues such as adding cost, difficulty in fabrication, minimized space for reinforcing, drainage issues, and a negative effect on the ability/quality of recycling. Therefore, if you must foam, die cut (EPS) foam is recommend.